LOCATION.--Lat 41°05'53", long 74°09'46" referenced to North American Datum of 1983, Mahwah Township, Bergen County, NJ, Hydrologic Unit 02030103, on left bank 350 ft downstream from State Highway 17, 0.6 mi downstream from Mahwah River, 1.0 mi west of Mahwah, and 1.2 mi downstream of New York-New Jersey State line. PERIOD OF RECORD.--Continuous-record discharge station October 1902 to December 1906, September 1922 to current year. October 1902 to February 1905 monthly discharge only, published in WSP 1302. Figures of daily discharge Feb 10, 1903 to Dec 31, 1904, published in WSP 97 and 125, are unreliable and should not be used. 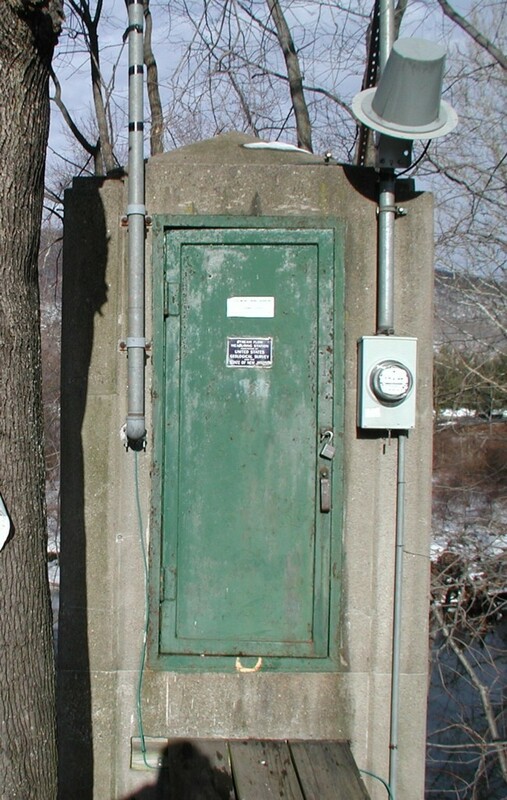 Gage-height records for 1903-14 are contained in reports of the National Weather Service. REVISED RECORDS.--WSP 781: 1904(M). WSP 1031: 1938, 1940. WSP 1552: 1923(M), 1924, 1925-26(M), 1927-28, 1933, 1937. WRD-NJ 1971: 1968(M). WDR NJ-82-1: Drainage area. WDR-NJ-87-1: 1986. WDR US-2011: 1984(M), 1999(M), 2010(M). WDR US-2013: 2011. GAGE.--Water-stage recorder with telemetry. Datum of gage is 253.10 ft above NGVD of 1929. Prior to Dec 31, 1906, non-recording gage on former bridge at site 250 ft downstream at different datum. Sep 1, 1922 to Dec 23, 1936, water-stage recorder just below former bridge at present datum. REMARKS.--Records good, except for estimated discharges, which are fair. Flow affected by diversion from United Water-New York well field upstream of gage (see 01387420). Occasional regulation from lakes and ponds upstream of gage. EXTREMES FOR PERIOD OF RECORD.--Maximum discharge, 18,300 ft3/s, Aug 28, 2011, gage height, 15.77 ft; minimum discharge, 0.2 ft3/s, Aug 11, 1993. PERIOD OF RECORD.--Water years 1963 to current year. PERIOD OF DAILY RECORD.--SUSPENDED-SEDIMENT DISCHARGE: February 1964 to June 1965. REMARKS.--Discrete water-quality data were collected as part of the New Jersey Ambient Surface-Water-Quality Monitoring Network. National Weather Service flood stage for this gage is 8.0 ft.